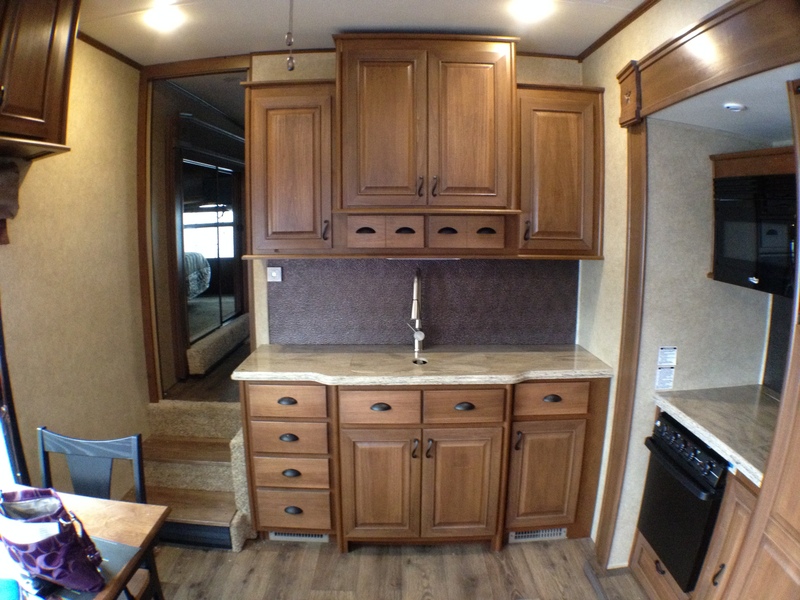 One of my big questions before embarking on this lifestyle was how well will the average RV hold up. 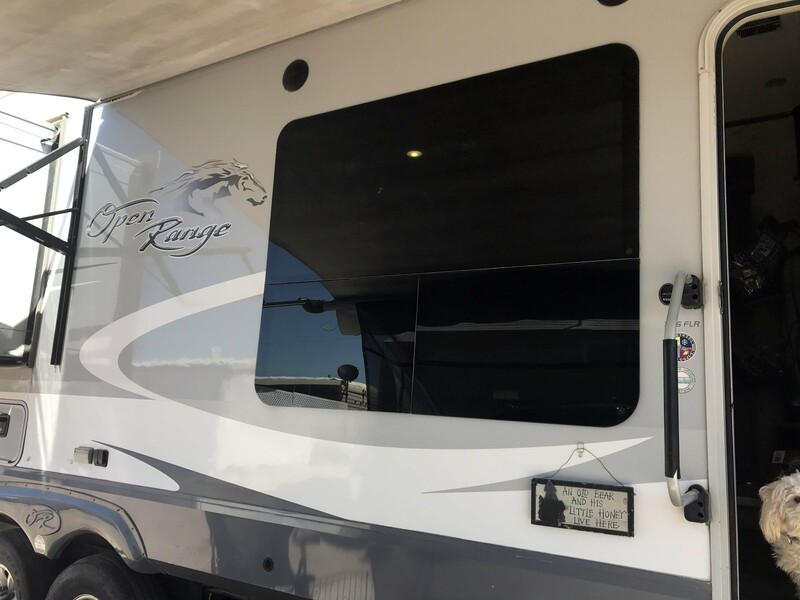 There are a few high-end brands that are specifically designed for the full-time lifestyle, but we like many other people bought a middle tier RV and have adapted it. 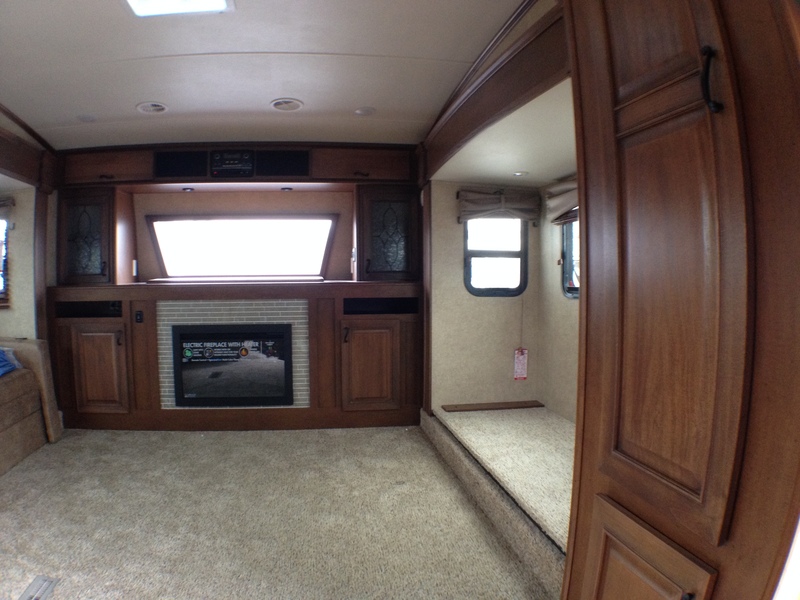 In five years we have put over 40,000 miles on the RV. It’s definitely been road tested, although we have also spent long stretches just sitting in one place for our summer jobs. 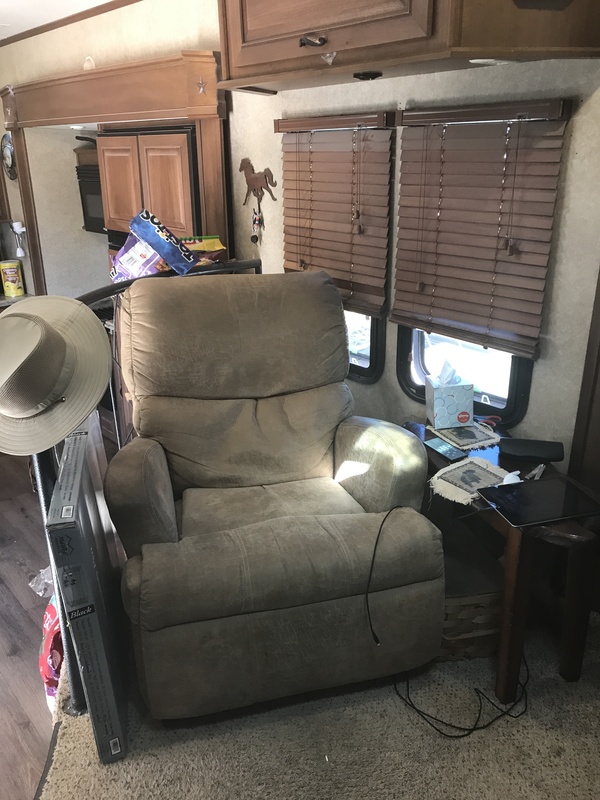 To answer the question on how it has held up, I am going to show you the before and after pictures and talk through some of the issues we have had. I will also discuss the enhancements and you can find details on how Lee did them on our DIY Mods Inside and DIY Mods Outside Pages. I can still remember picking it up and how shiny and clean everything was. 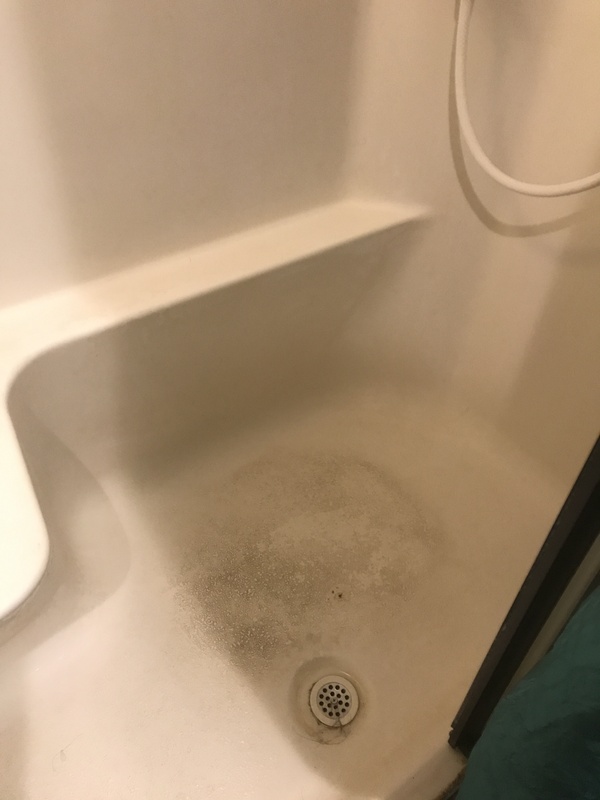 Obviously the place is lived in, the pictures will show that, but cosmetically it has held up much better than I expected. Let’s start in the bedroom, which has probably changed the least. 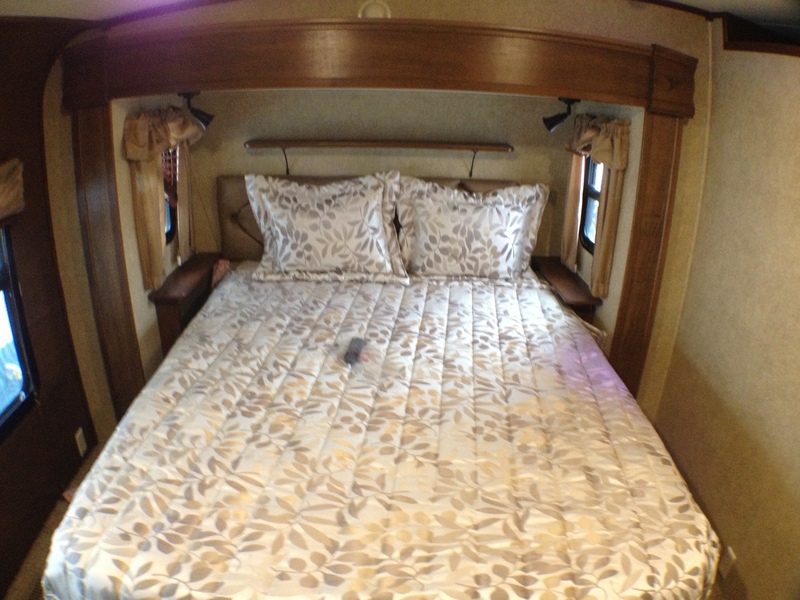 The RV came with basic bedding and absolutely horrible valances. We removed the valances right away, with the vague idea Lee would build something custom and I would make something to cover them. Neither of those things happen so the blind hardware has been bare this entire time. Honestly it rarely bothers me and I personally am still a huge fan of the wooden blinds. Yes they get dusty, but I have never been a person who cares that much about dust. I will say that little shelf in the back does catch a ton of dust and really doesn’t serve any practical purpose. The two side night stands are used every night though and I would never have an RV without them. The wood on the night stand is a little scuffed up, but other than that pretty much the same. Lee added a reading glasses holder on his side (with command strips) and above some hooks where he can put the IPad and stream a TV show at night. We have a TV in the room, but we rarely use it. 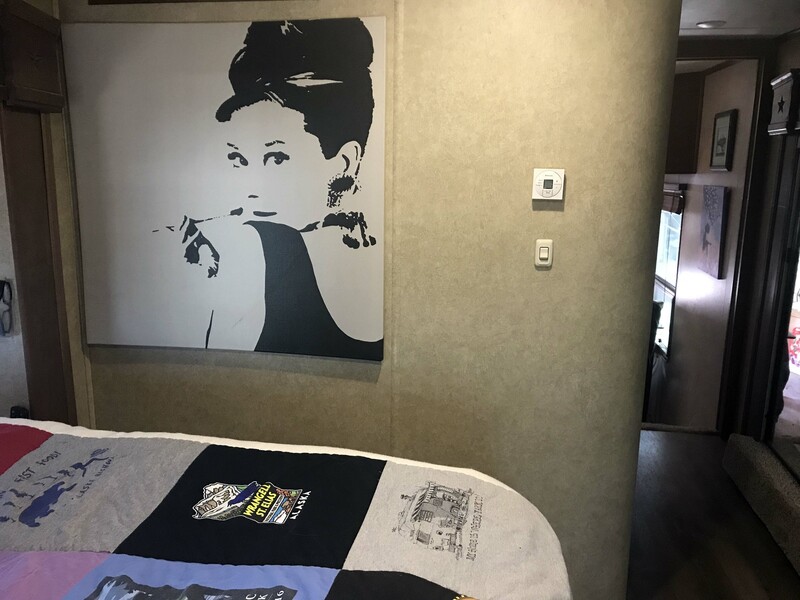 Even though it is on an arm, the picture is really too far to see from the bed and I think I have probably used it less than ten times in five years. 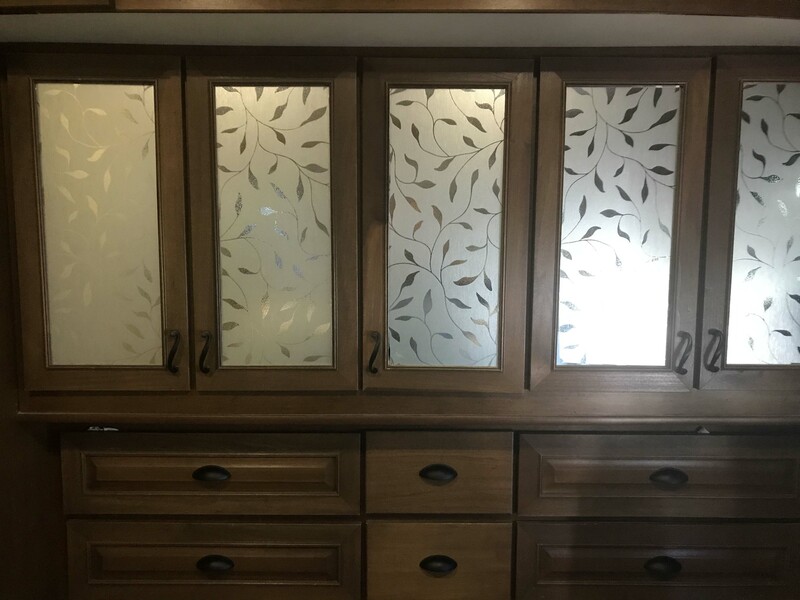 The dresser area has held up VERY well and I am so happy Lee insisted on full depth drawers. 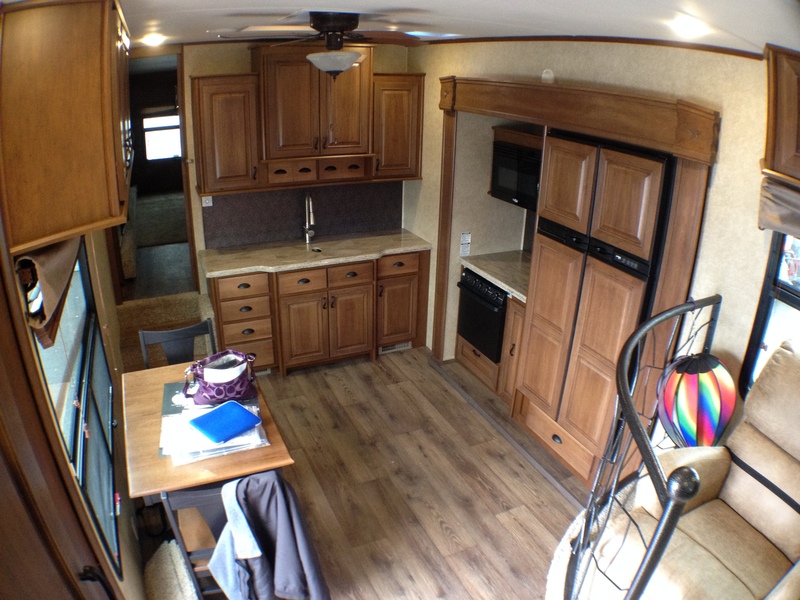 Many RV’s only have shallow drawers and we need all of this space. 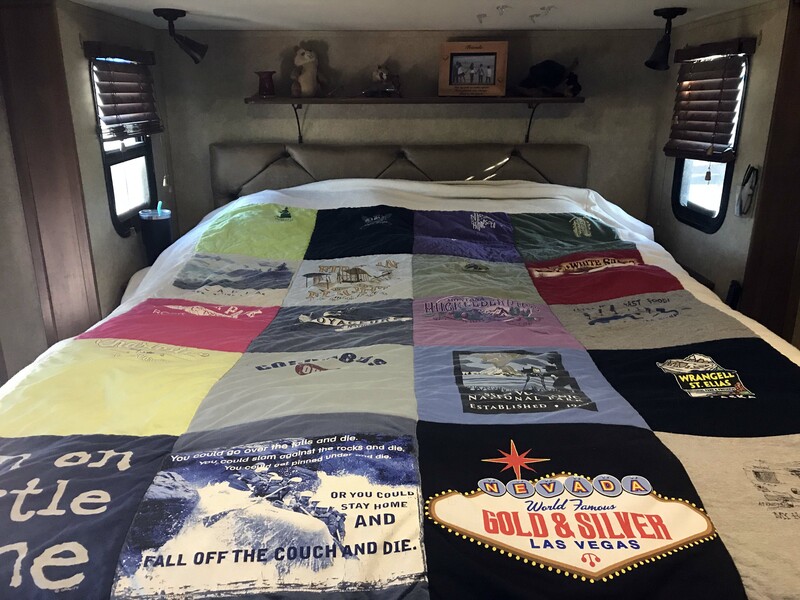 Our travel quilt is one of our favorite things although we also have a lighter weight one for warmer weather and an electric blanket for when it gets really cold. 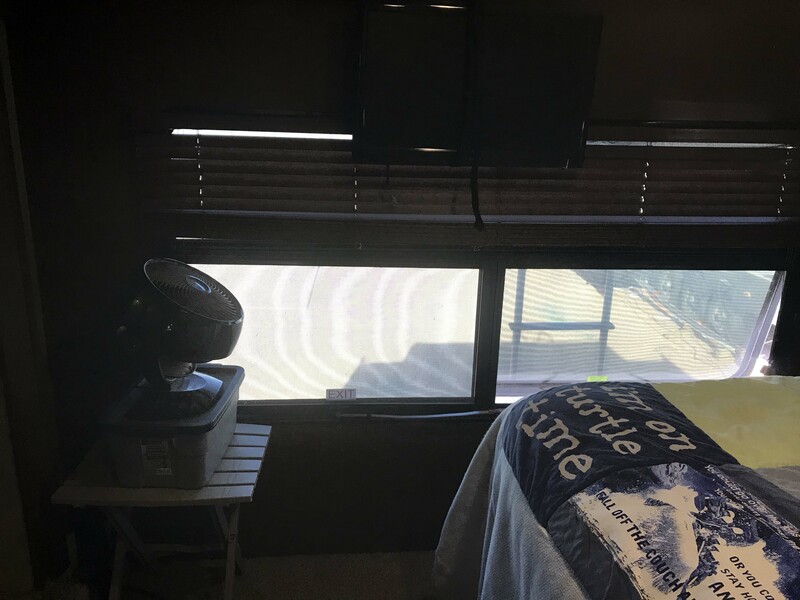 I have to have a fan, so we added this little fold up table and Lee put in an extra outlet and an extra 12 volt plug for the fan we use when boondocking. This artwork came from our house and is very lightweight. It stays put well despite the bounciest of roads and has held up well. These were mirrors originally and I hated looking at myself first thing in the morning so Lee put Artscape window film on and it has held up VERY well. I still really like it. 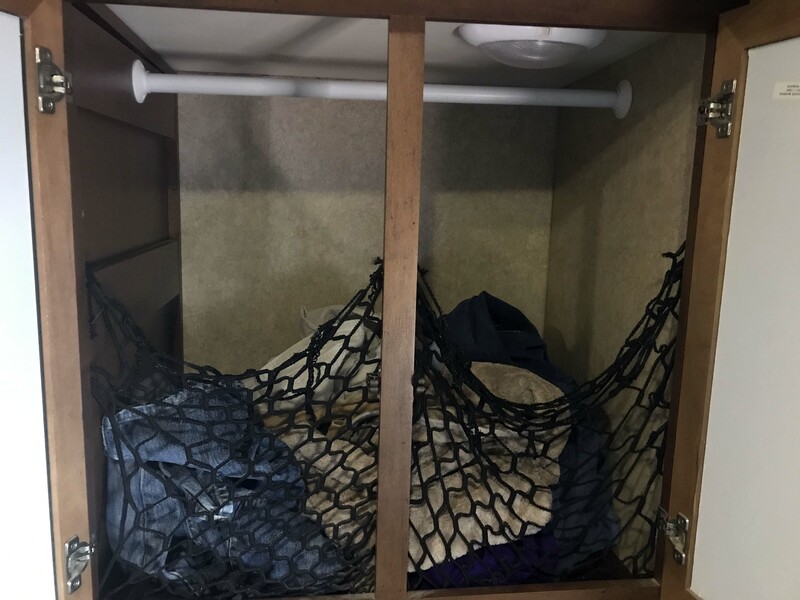 One of my favorite mods is how he turned part of the closet into a laundry hamper with netting. 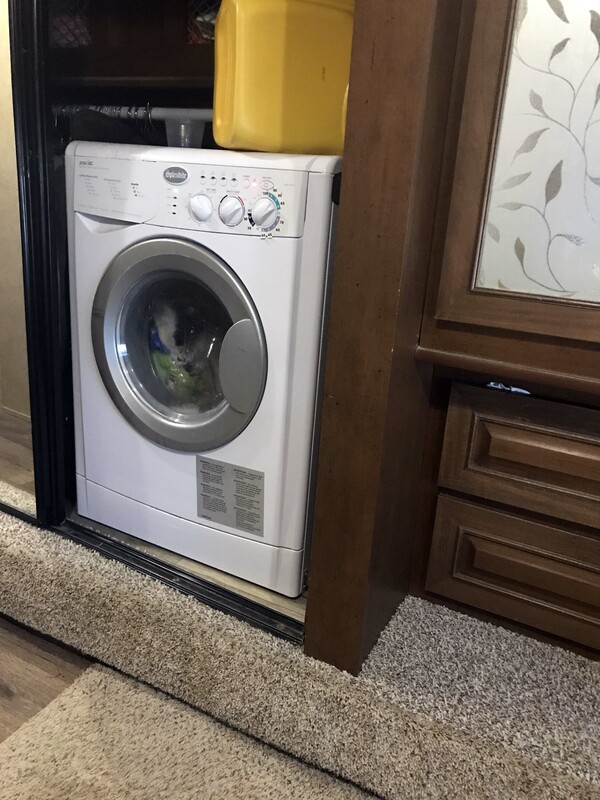 The laundry hamper solution is a challenge in almost every RV and this really works for us. 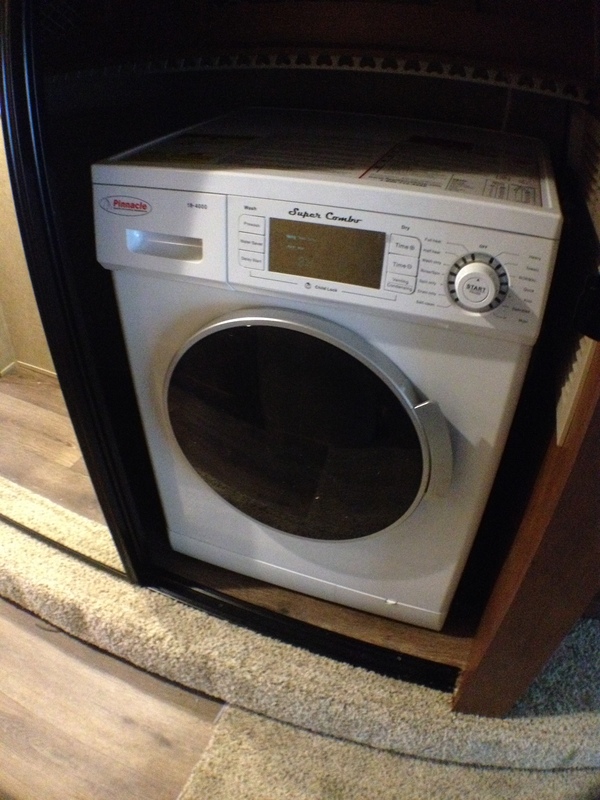 We knew from the beginning that we wanted a washer/dryer combo and we are so glad that we have it. We use the washer dryer all of the time and only go to a laundromat when boon docking or for our blankets etc. 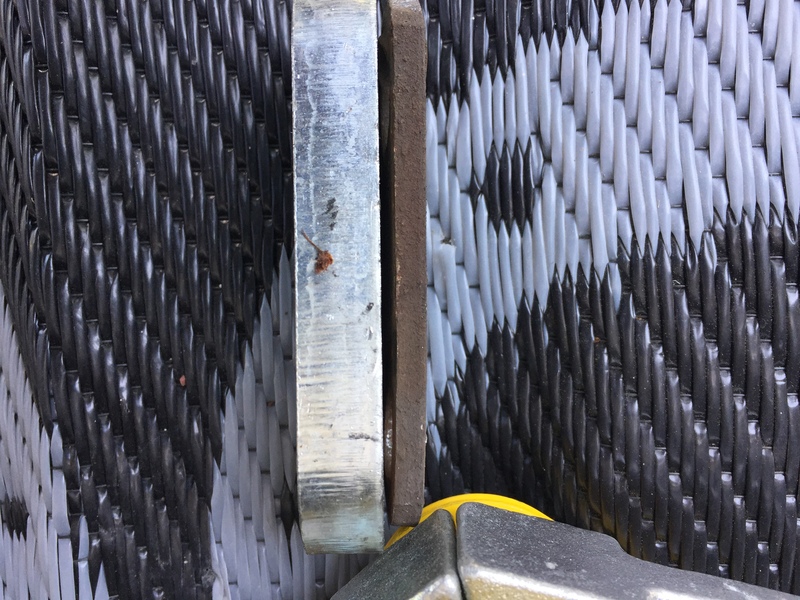 Unfortunately the first unit we got with the rig never worked right and we needed to use our extended warranty right away. We had technicians out twice before they finally received permission to replace the Pinnacle with a Splendide. I will say we occasionally have issues with it when we are on unusual power. It’s not just us, Greg and Cori have had similar issues, but mostly it works great and we feel lucky to have it. 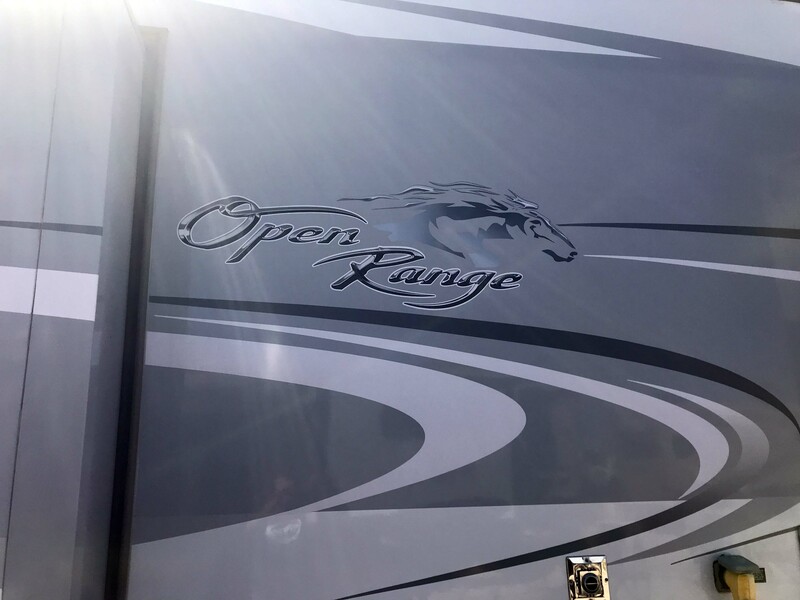 Would never get an RV without one. We have only had two problems related to the washing machine. One is before traveling you have to store the laundry soap inside the machine. One time I forgot and it fell off, cracked, and laundry detergent leaked into the floor. It was impossible to get out, never evaporated, and ultimately contributed to having to get the floor replaced. When we got the slide floor replaced they couldn’t quite match the carpet so it is slightly different now around the slide. 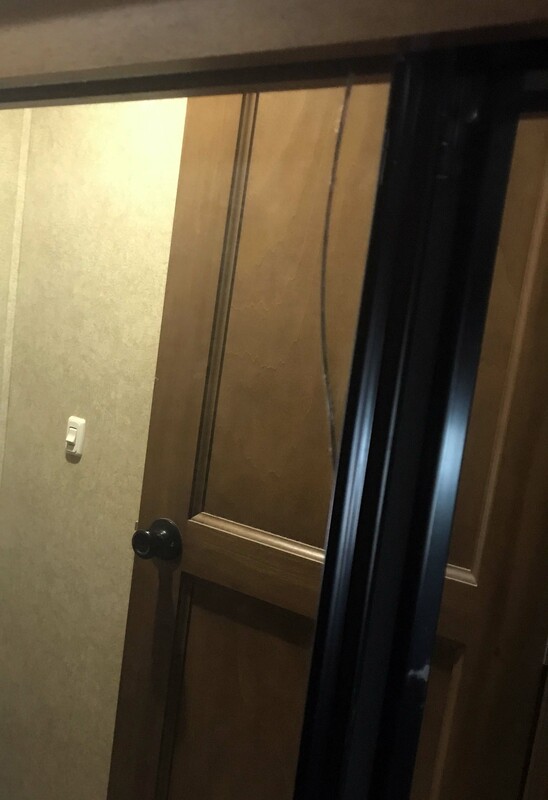 Our second issue is the mirrored doors to the closet are cracked. These doors see a lot of use and have not held up well. Unfortunately they are not that easy to replace so for now we are just living with it. Replacement Splendide. If you look closely at the carpet in the bottom you can see it doesn’t match. Crack in upper right portion of left closet door. That bugs me. Of all of the rooms I would say the bathroom is the most beat up. Not surprising because it sees a ton of use and also because I find it very hard to clean in there. My claustrophobia is mostly a non-issue in the other rooms, but I tend not to spend a ton of time in there. The shower itself has some nicks at the base and the doors are pretty bad. The glass is cloudy and in the corners it has mildew etc. 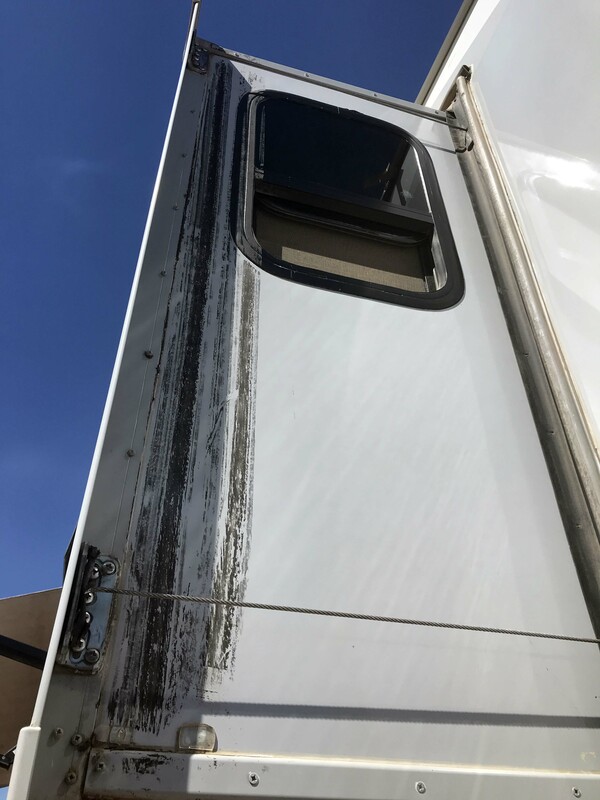 Lee and I have both tried to get it clean, but without completely taking off the doors at this point I don’t think it is possible. 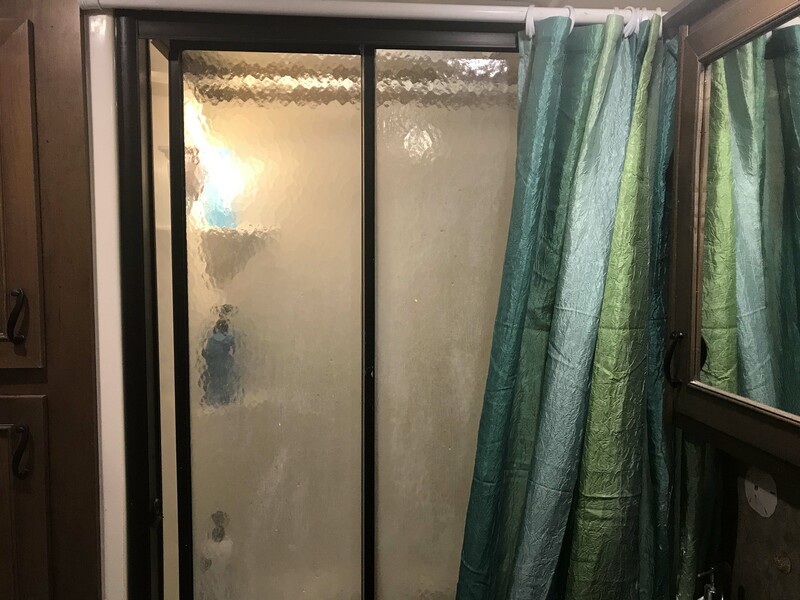 Instead I took the route that many others have and added a shower curtain. When company comes over I just pull the curtain closed so no one sees. 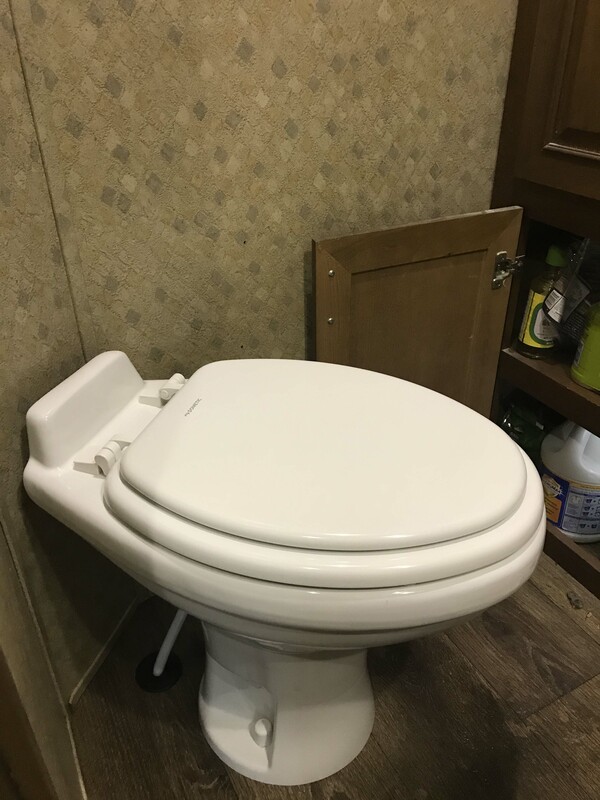 The one really good thing we did do was upgrade to a larger toilet. 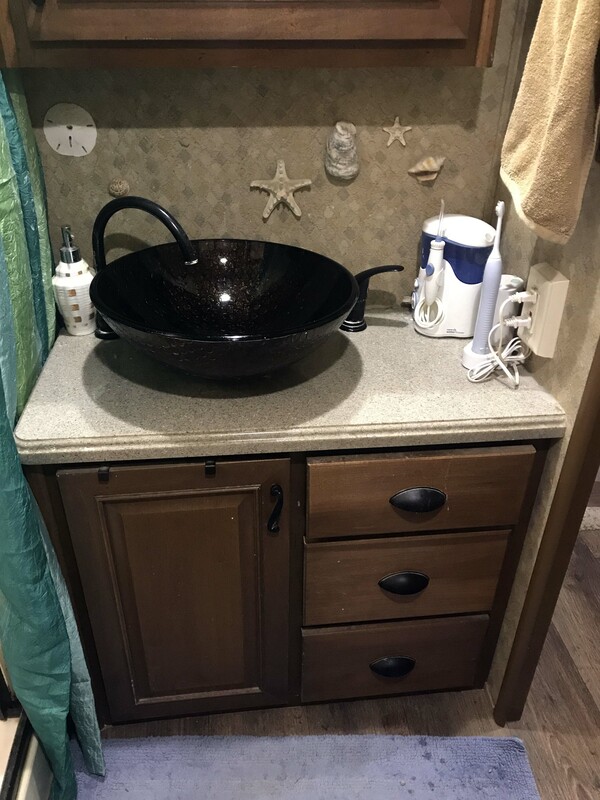 I hated the small toilet that came with the RV and the larger porcelain one was a HUGE improvement. 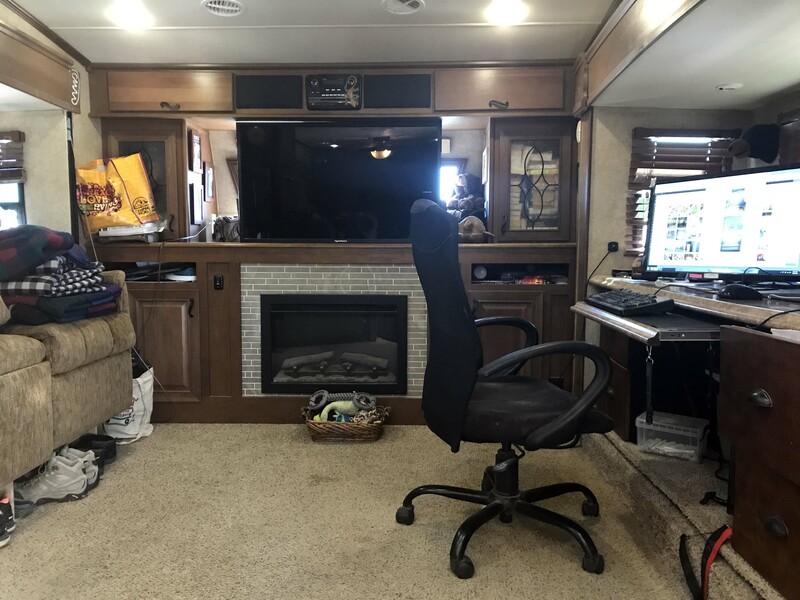 This upgrade still make me really happy and I would never own another RV without having this changed. It’s that big of a difference. 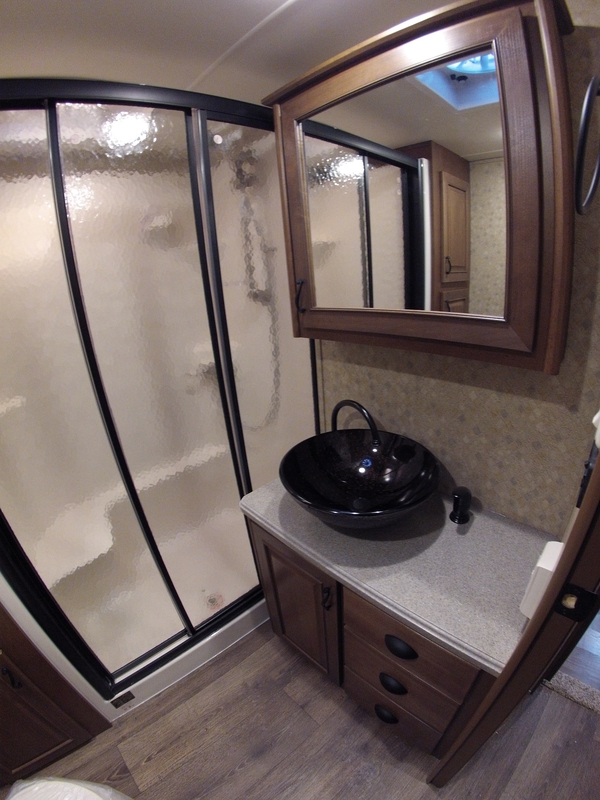 Brand new shiny bathroom. People really like the bowl but honestly it’s kind of hard to clean. It gets splatters underneath. Current. The soap scum and mildew drive some people crazy. I’ve learned to live with it because the amount of work it takes to stop it from happening is frankly not worth it to me. Lee says the stains and nicks at the bottom will never come out. The whole piece would need to be replaced. The front of the drawers get toothpaste etc on them. I wipe them down but back the next day. It’s just a really small space. Old toilet which I hated. Low to the ground and never felt “secure” on the plastic. New toilet is taller and porcelain. Feels more secure. 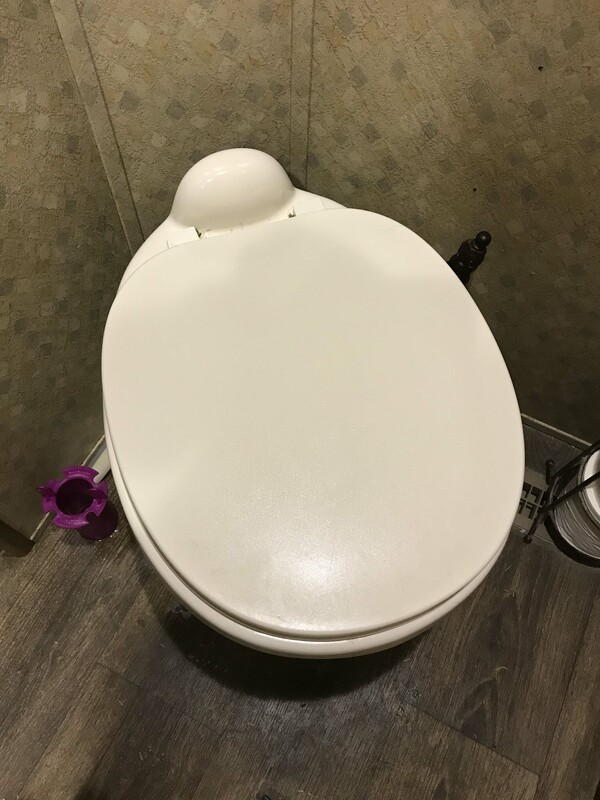 the only downside is a small amount of water goes in after every flush. That’s great for keeping it from getting stained, but not so great when trying to conserve water while boon docking. The only downside though and a minor one at that. The other space that has probably taken the most beating is the kitchen. 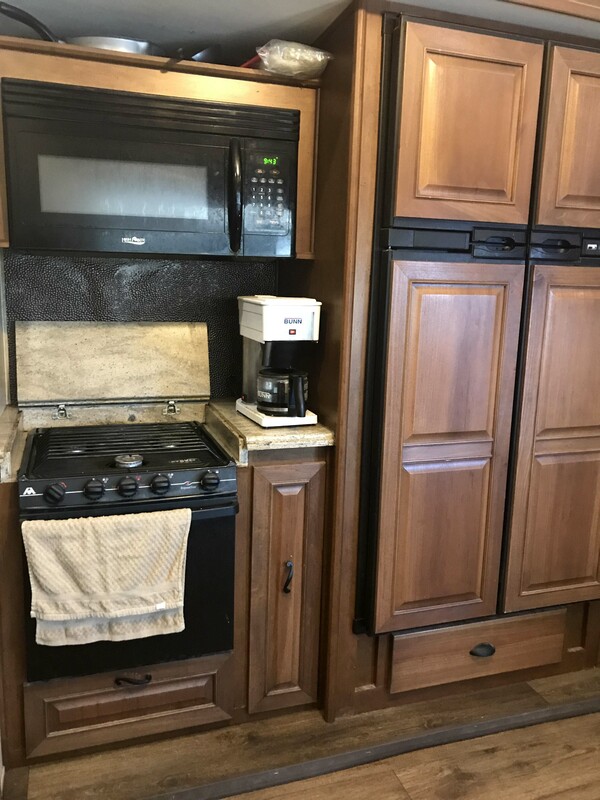 I use our kitchen a lot and although the cabinets have held up extremely well, the stove area and floors are a bit of a mess. The trim around the refrigerator slide is loose and the floors are pretty scuffed. When I clean them they will look good for a few hours but in general tons of dust, small rocks etc tend to accumulate. Essentially it still looks good from a distance but when you get close up you start to notice all the little nicks. I just try to not let it make me crazy. 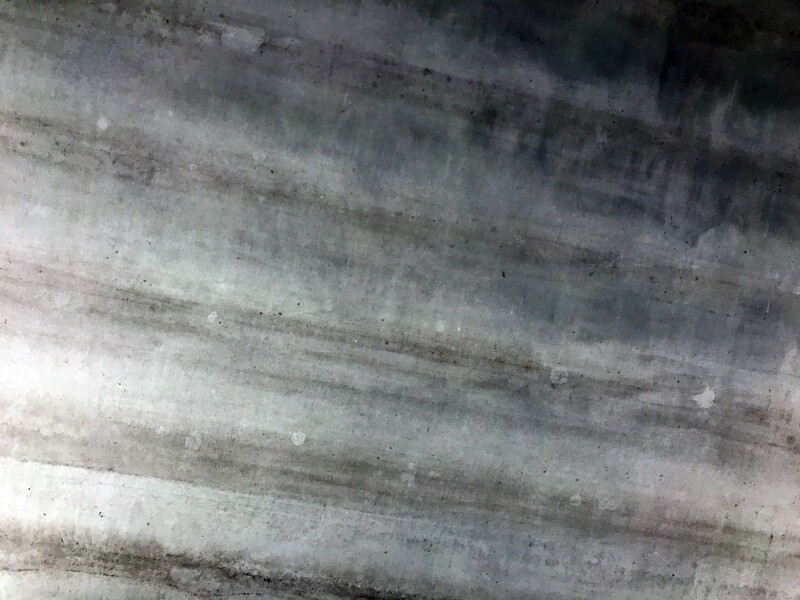 One of the biggest problems we have had is over time the sink developed gaps between it and the counter top. It was a significant enough problem that once Lee replaced the sink and another time tore it apart and resealed the whole thing. I find this really annoying because it is a pretty basic structural defect. It is well within Lee’s ability to fix though so ends up being an annoyance rather than an emergency. One of the best things we did was replace our table with a standard dining room table and ultimately we replaced the chairs with standard cushioned chairs. I use the table routinely for cooking or computer work and the chairs were super uncomfortable. I just wish we hadn’t waited so long to get regular chairs, because the new ones are sooo much better than what we had before. At this point you might be wondering why we just don’t have the warranty take care of it. Turns out that getting warranty work done can be extremely painful. Since we travel we can’t go back to the dealer and have to find a shop wherever we are. It’s never quick, we always have to wait too long for parts, and the quality of work has been substandard on several occasions. That being said I still 100% recommend getting an extended warranty. There are some things Lee can’t fix himself and others that are just too expensive. We spent $4,000 on our platinum extended warranty and so far have gotten $3500 worth of value from it. Since it lasts until 2021 I have no doubt we will get our money’s worth. Current State. If you look around the handles on the bottom cabinets (where the trash is) you can see the wear. The upper cabinets have held up much better. That bright spot by the way is from the sun. New view from living room. Current view from living room. The new dining room tables and chairs don’t take up that much more space, but definitely better for what we need. The one major change we would like to make in this are is to replace the microwave with a convection. If I would have had any idea on how neat they are I would definitely have insisted on one. 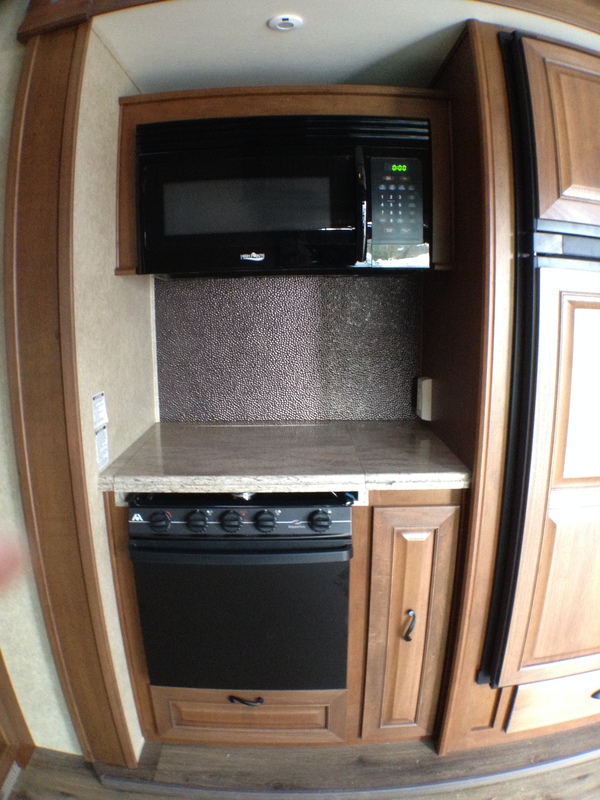 Then Lee want to put in a propane stove top and we can reclaim the oven space for storage. Two big problems with the propane oven. First it cooks unevenly so baking anything that requires precise temperatures is out of the question. Second it really makes the rig hot. This can be a benefit when we are in a chilly place, but requires running the AC when we are in warmer climates. 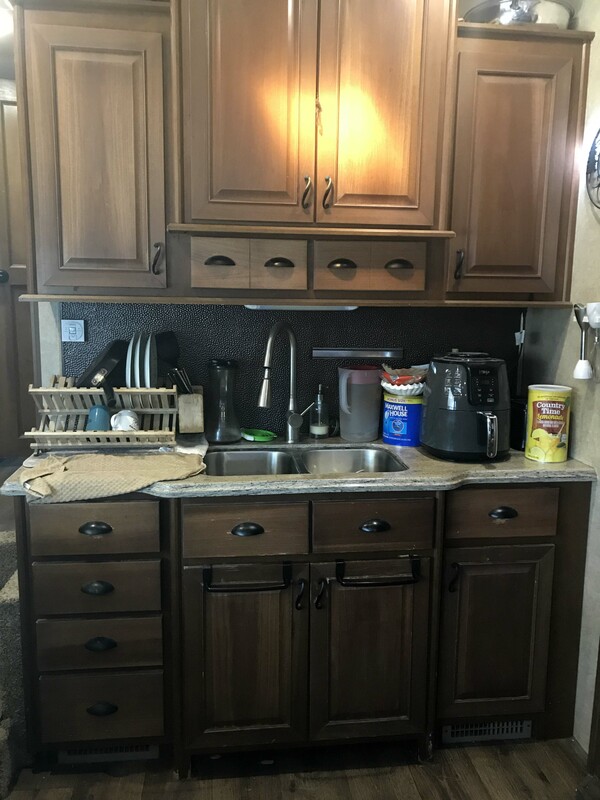 Between a convection oven, Air Fryer, and Instant Pot we feel we will have all of our bases covered and we could use the oven space to store our Instant Pot and Air Fryer, which currently don’t have a permanent home. Some people would remove the propane all together and go with induction plates, but we like having propane burners for boon docking. 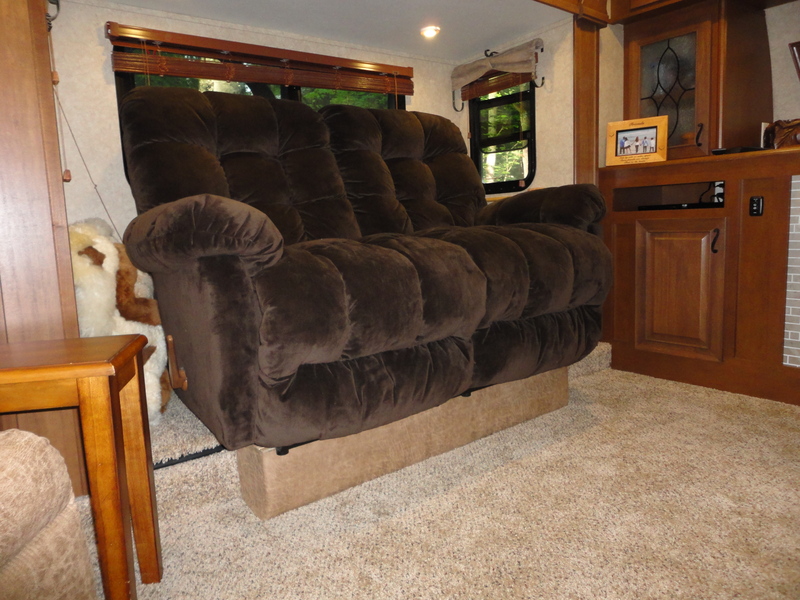 The biggest changes from when we picked it up were definitely made in the living room. We are on our third couch in five years because of the unique setup of our slide. We purchased our current couch at Lambright in Amish country and although isn’t a perfect fit for the slide is closer to what we want. 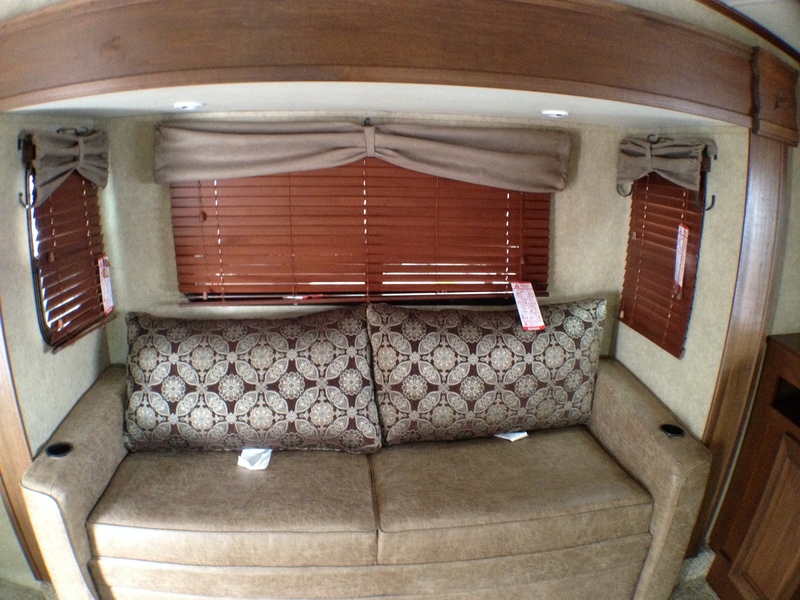 We also removed all the valances in this room and once again just have the hardware. The original couch which was super uncomfortable. It was great that it opened into an air bed but I couldn’t sit or lay on it easily. 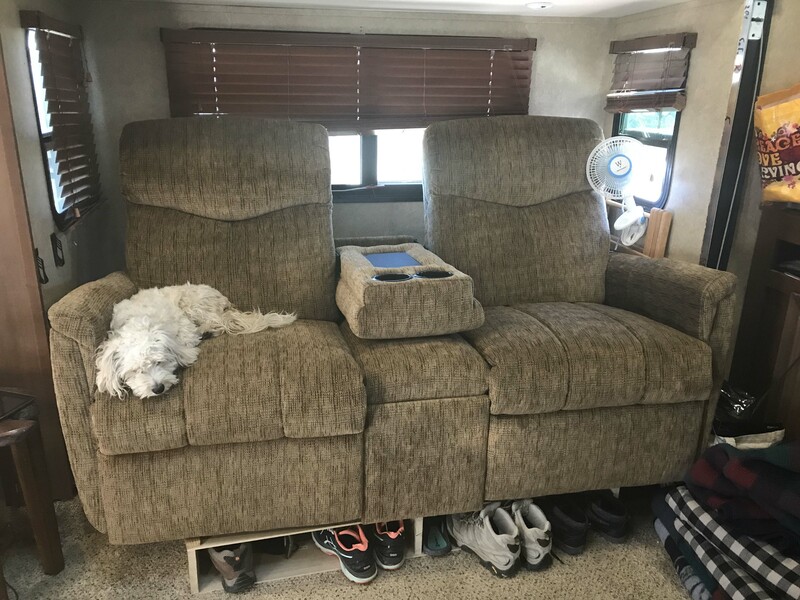 We bought out second couch before we even went on the road but it was just a standard loves eat. Once big problem was the back covered the windows which significantly reduced our airflow. It was comfy though. Our current couch breathes better and has slightly shorter backs. It also has a center section that comes down allowing for more airflow. Because it gets so hot up in that corner we have also added a small fan which helps. Unfortunately it still sticks out and Lee built a second base for it to rest on and this time built-in a shoe cubby which is nice. The only downside is you still can’t put your feet on the floor which is awkward when guests come over. I usually have it reclined so it doesn’t bother me. As you can see in the next picture we intentionally had the second couch left out. Lee knew he wanted to build a desk and that has been absolutely awesome. 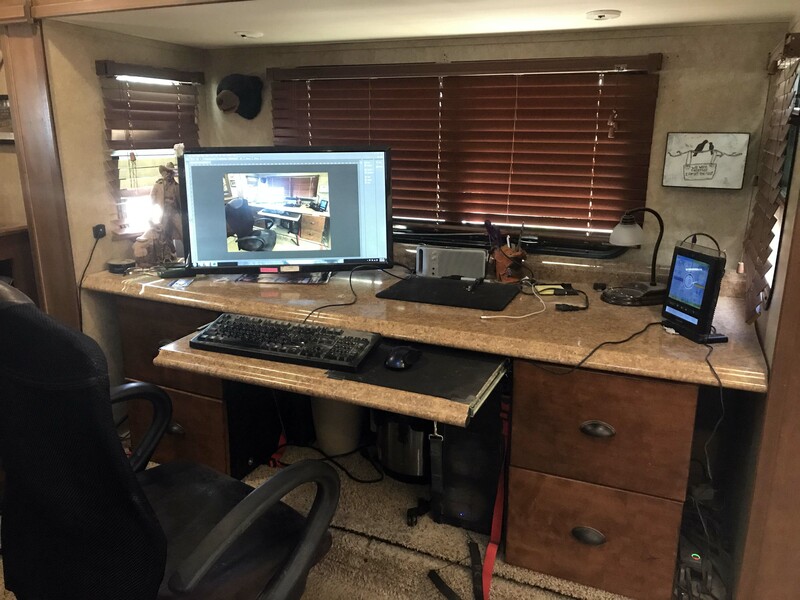 He added a slide out keyboard mount later, which really improved the design and all the details on how he did it are on our DIY page. 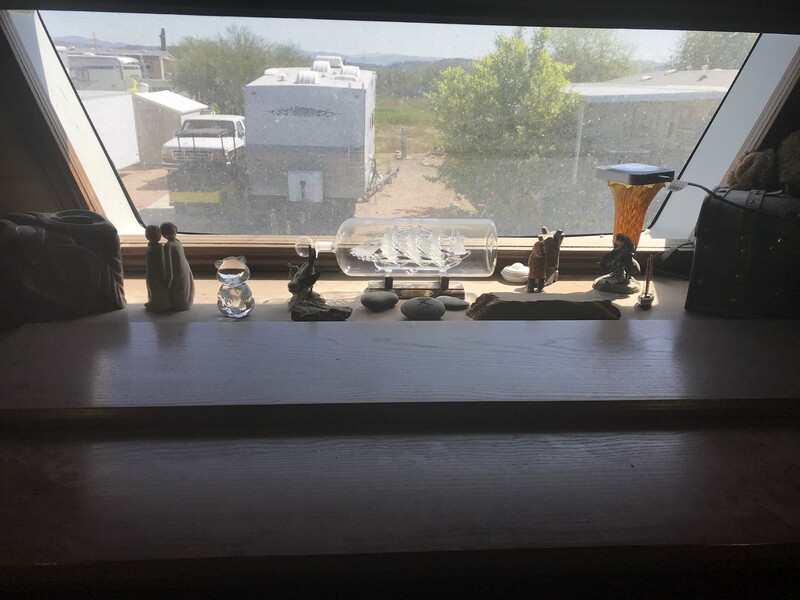 One thing I loved when I initially bought the RV was the front window. I still like it but because it has a structured screen print on the front it is very difficult to clean. Dust and bugs also hang out in that section and it’s hard to get back in there. It really doesn’t matter much though because it turns out we keep the TV up most of the time. We use it as a second computer screen or just have it up with a running slide show of our pictures. It comes down when we travel of course but I am sure it is up 90% of the time we are stationary. 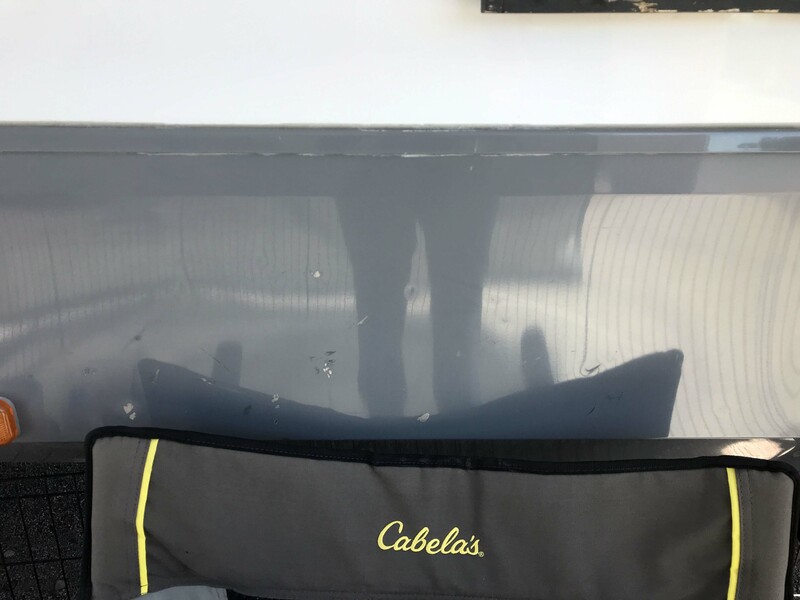 The only downsides to the TV is unfortunately it isn’t smart TV, which we would like to have AND in the process of putting it up and down the power plug often wiggles loose. Lee usually deals with that, because you can’t see the plug you have to feel for it. It happened while I was taking pictures for this blog though and I managed to do it myself. It’s just a poor design and another reason we usually leave the TV up. Our desk area which I love. Only downside is does get a little hot in that corner sometimes. The carpet has held up remarkably well considering how light it is. Replacing it would be a huge job because of the slides and desk. I love the front for a place for special knick knacks but not so much for the dust. And the window is always dirty. See that red streak in the corner. A big blood splat against the window and bled between the grill and the glass. I have tried everything to get rid of it, including hydrogen peroxide and a Qtip but it is stubbornly not leaving. I try not to think about it anymore, because without replacing the glass I am stuck with it. Lee’s chair area hasn’t changed much at all. The only difference is we added a table that Lee made from a piece of wood we got in the Redwoods. Current. The chair is original and held up very well. Overall the inside is doing pretty good. Our biggest problem has been repeated issues with our slide cables, which thankfully Lee can usually fix himself. We knew when we bought the Open Range the slide system was unique, but Lee wanted something he could work on himself. And to be honest I have not been easy on these front slides. Still it is my biggest complaint about the interior of the rig and for me feels like a structural defect. Speaking of structural defects it is time to talk about the outside. Lee is working this week and unavailable to add to this post, so I will do the best I can hitting the highlights. As you can see below everything was bright and shiny when we picked it up, but of course are a little more beat up now. the main cosmetic changes are that Lee removed the swirls from the windows, which I really appreciated because it opened the window up. 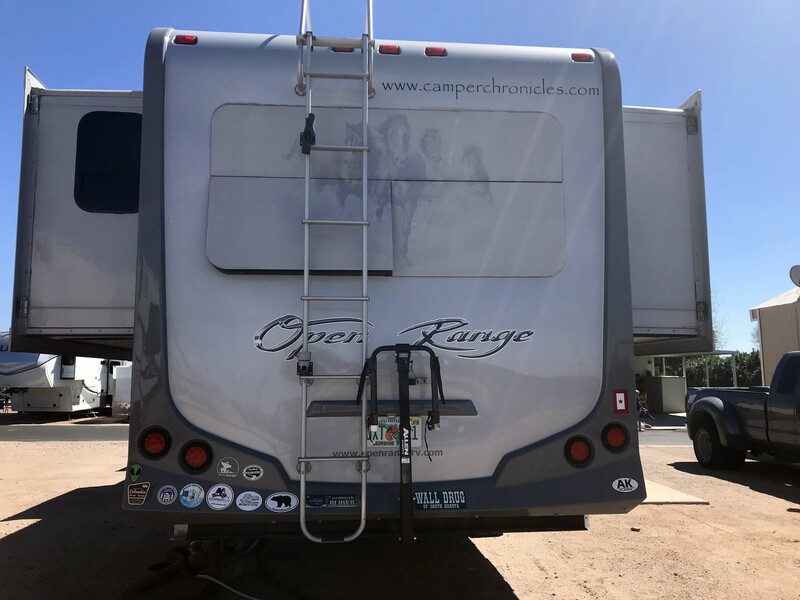 The logos on both the front and back windows are also getting a little faded but this seems to be a common problem with older RV’s. We like the way it is fading though because of the light colors it really doesn’t look that bad. 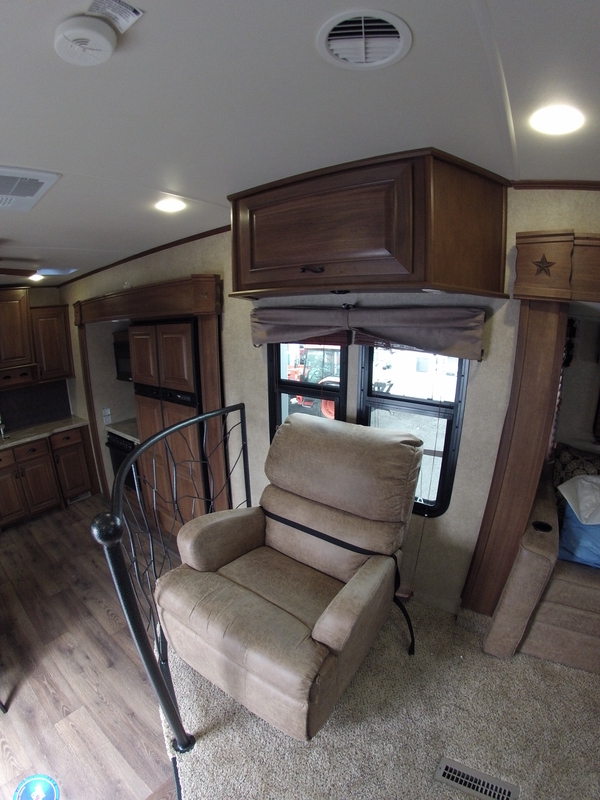 We actually are very glad we have a light-colored RV. It hides the dust better and the paint doesn’t show fades nearly as much. The only thing we have added is our blog logo on the front and a quote on one of the slides. They are getting a little frayed as well, but holding up ok. 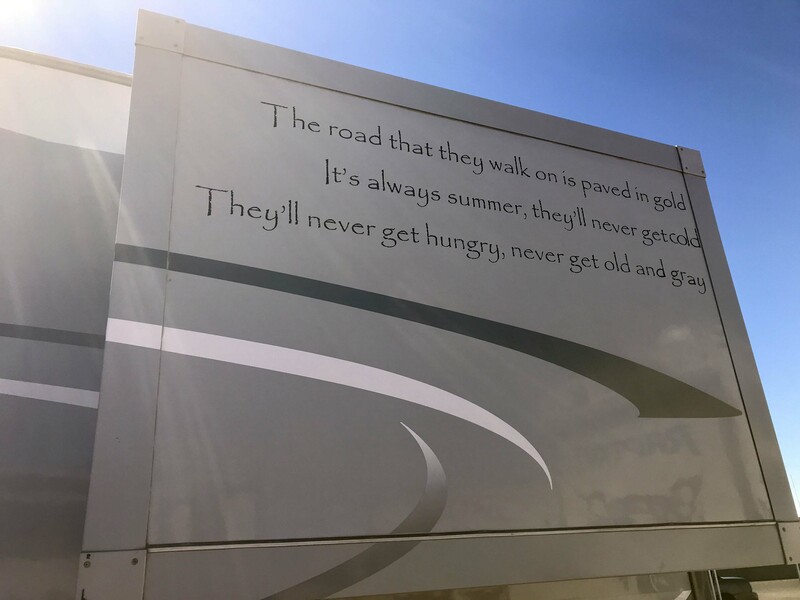 The quote we added on the side. The windows are so much better without the swoop through them. It really looks pretty good. So cosmetically we are fine but we have had our share of structural issues. Pretty early on a truck in front of me lost its tread and it bounced up and hit our stairs and trim. 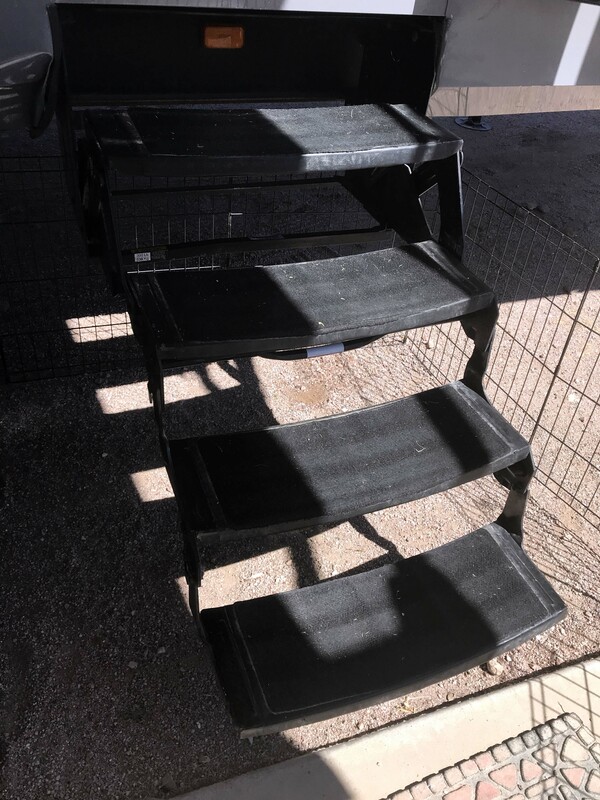 Eventually we had to replace the stairs because they were bent but we just left the trim piece. Too expensive to fix. We also upgraded the tires to G’s which I highly recommend. 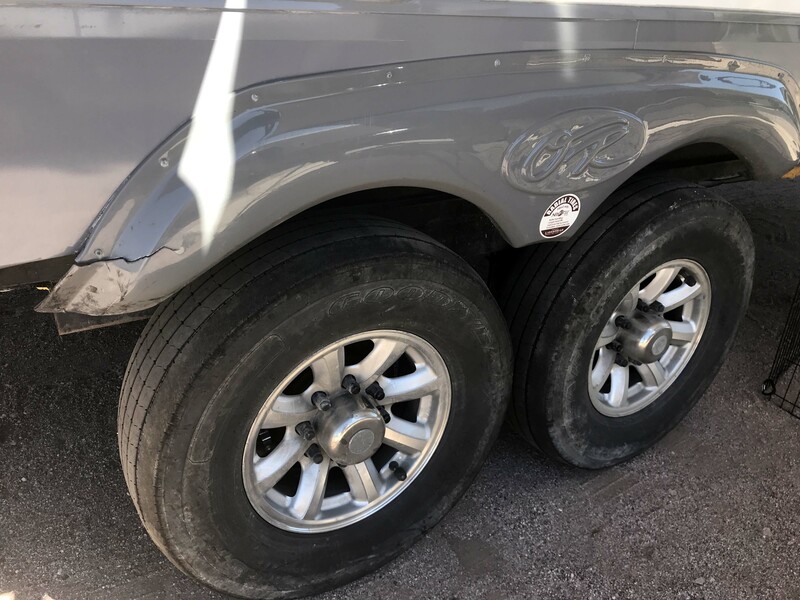 The tires it came with were awful. Would never have cheap tires again. We also have some dings on the side because I hit it with my chair. again minor issues. The awning has done ok, although we have had a couple of close calls. The underside gets stained, no easy way around that, and although I have cleaned it a couple of times it’s a rough job and not really worth it to me. It’s also starting to rip a little in one corner which is concerning because they are not cheap to replace. 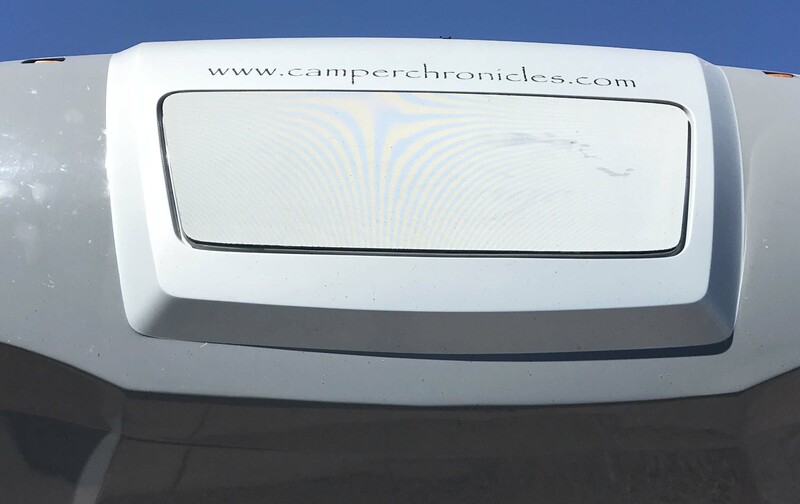 We are super careful with our awning in bad weather because we know how easily they can get ruined. Although we deliberately chose not to have slide toppers (and I don’t regret it for one second), I do wish we had an auto-retracting awning. that seems like a nice feature although it is something else to break. 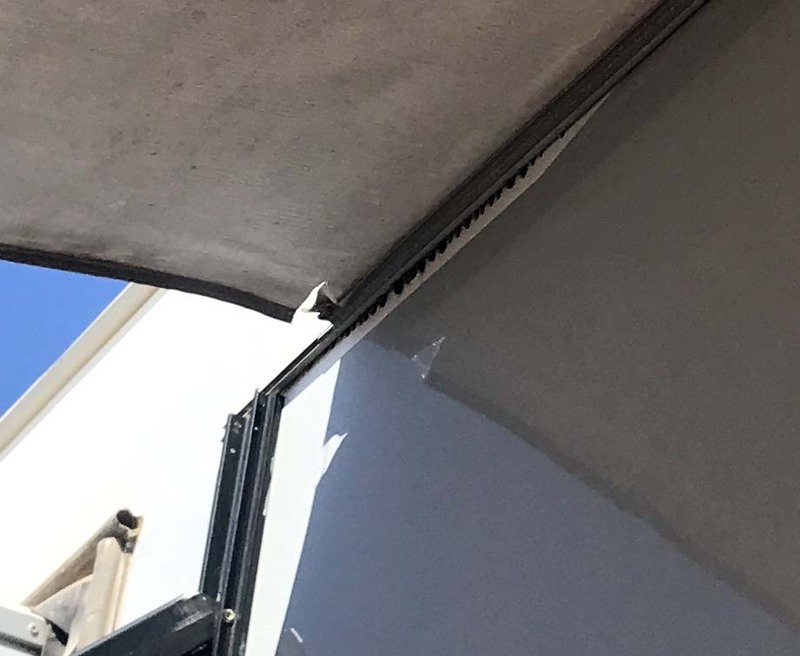 the underside of the awning. We do have stains on the sides of our slides because we don’t have slide toppers and the water runs down, but again would never have them. We don’t have to put our slides in when the weather gets bad just worry about our awning which is quick to bring in. Storms are sudden in the west. One of the biggest structural issues we had from the beginning was with the front jacks. We are not alone in this because they are often designed poorly. One of ours bent early on and Lee fought with that thing for years. Ultimately it failed and he could have been seriously hurt in the process, and he finally replaced them. They work much better now and he added a remote control system so he can lower and raise them while he is in the truck. This makes hitching MUCH easier for him and is one of Lee’s favorite mods. We are not alone in having front jacks fail by the way. We have two close friends who have had the same thing happen. 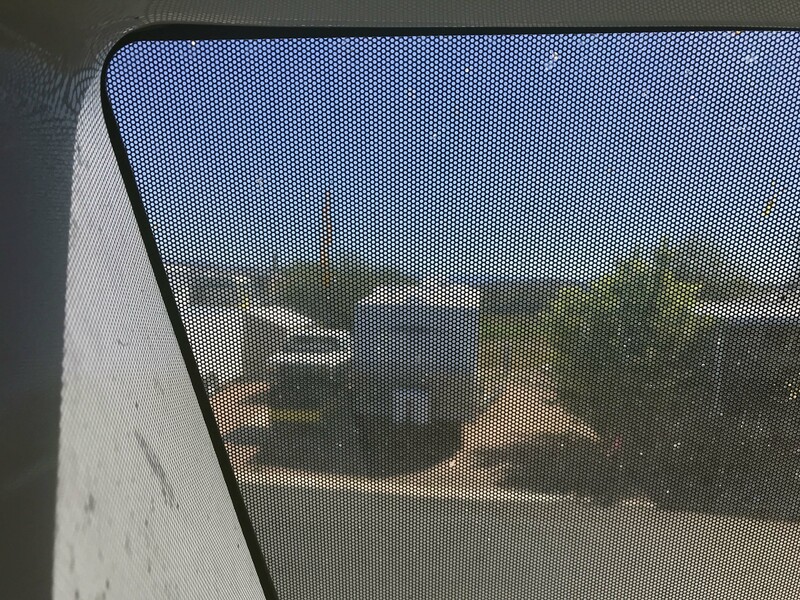 Thankfully in all cases there was no people or rig damage, but this is not an area of the RV to take lightly. They seem so slender for what they hold up. Finally we come to the frame. Ten days after our two-year Lippert manufacturers warranty expired we broke a shackle. Since we could not travel until it was fixed we did call a repair technician and our extended warranty ultimately paid for it. Lippert on the other hand refused to pay for it despite how close we were to being in warranty. The big takeaway from the repair was the difference in our existing shackles and the heavy-duty ones. It truly was night and day and made us think more seriously about what we were resting on. 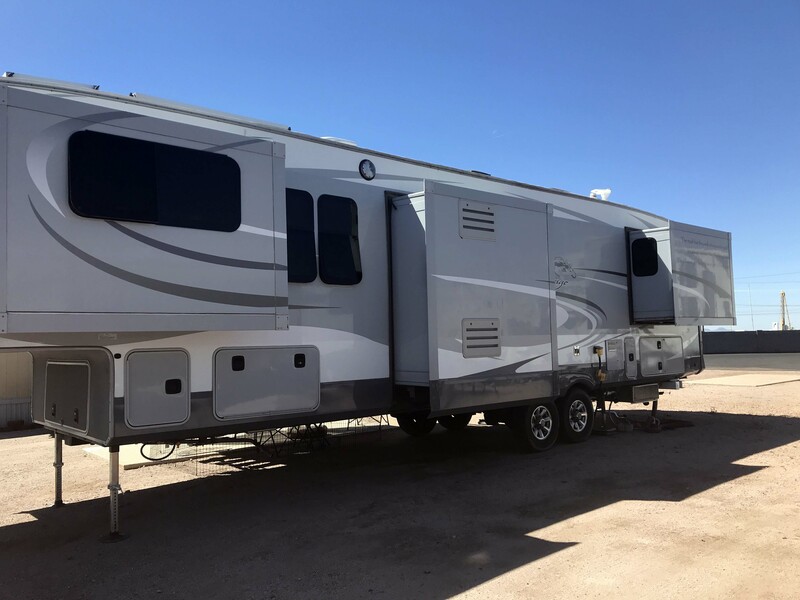 Ultimately we decided to get a Mor-Ryde heavy duty suspension system and again the difference in one came with the RV and the upgrade was stunning. I am a layperson and it was easy for me to see. 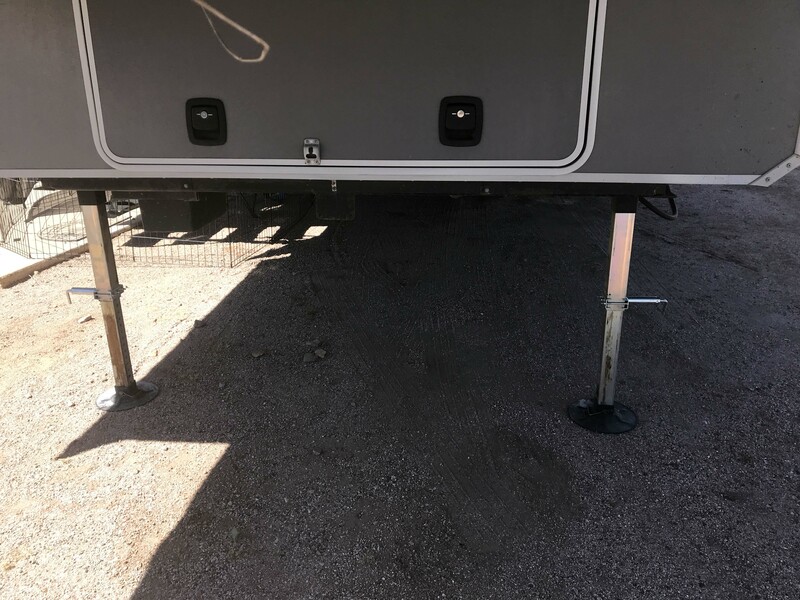 Consequently I would never full-time in an RV without a heavy-duty suspension system. Although we did just fine for the first couple of year we have no idea what unnecessary stress we put on the rest of the rig. That is why I would have it from the beginning. The new shackle was on the left and the old was on the right. World’s of difference. 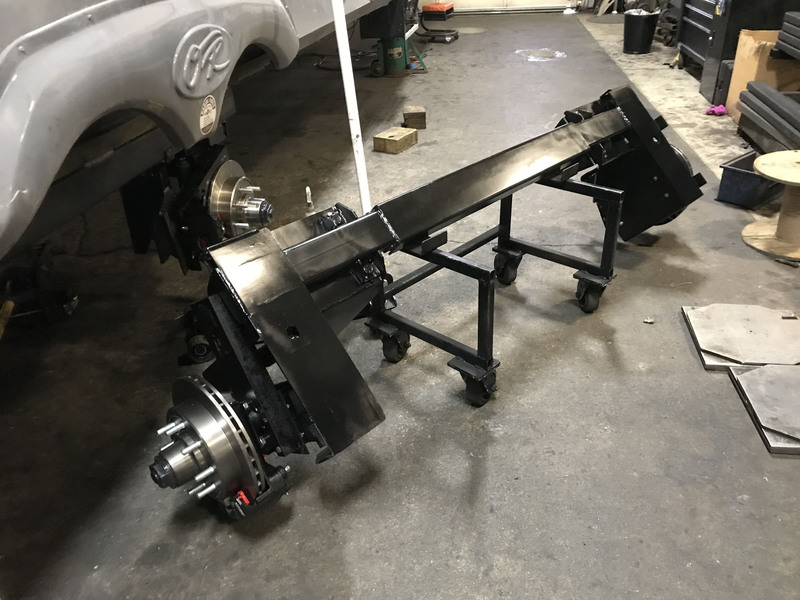 New axle. Again no contest. Why I mention the unknown stress is that at the five year mark we may have a brake in our frame. We are taking our rig to a welder on April first and we will know once they take a look at it. Unfortunately to see the problem they need to take the skin off which is time consuming and expensive. We have no idea what we are getting into until they see it and there is even a small chance the rig may need to be totaled. 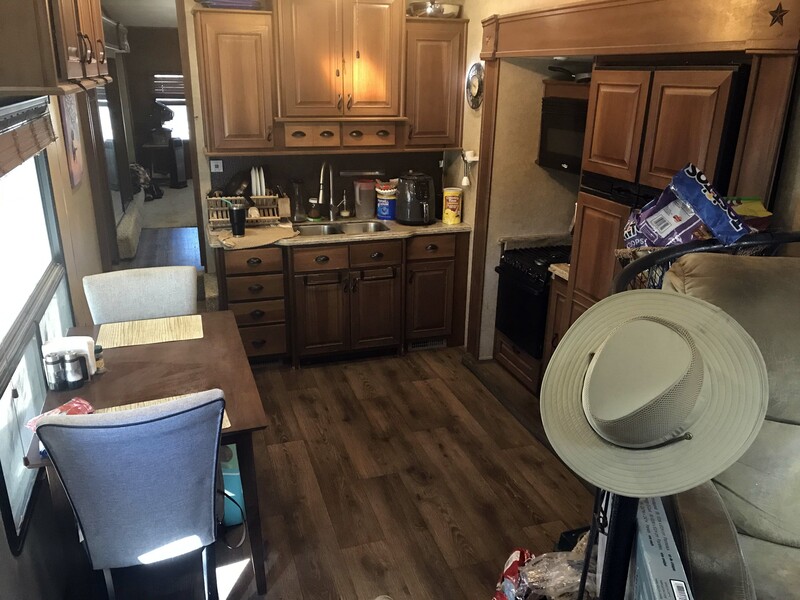 As much as I love my RV, if it can’t be repaired I lose my home. If the warranty company won’t pay for it, I lose my financial cushion. According to the contract it should be covered, but the welder says they will rarely pay. 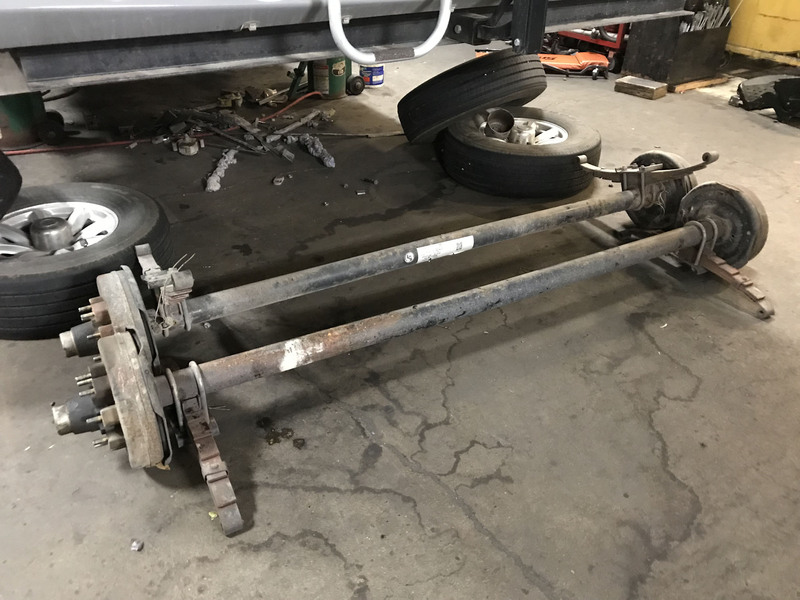 This one repair could change everything, and personally I believe that if we had gotten a heavy duty suspension system sooner it may not have happened. That being said, the regular frame should last more than five years. Anyways, here is my happy face the day we took possession of our new home and five years later I still mostly feel the same way!